When you purchase items from our online store, you’ll help support the important work of the American Kidney Fund: providing direct financial support to patients in need; health education; and prevention efforts. 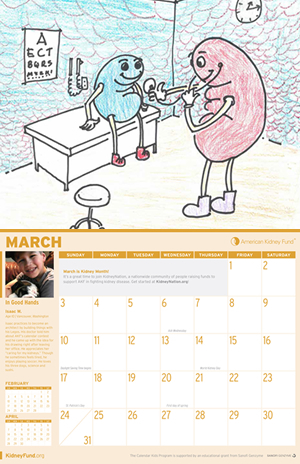 Decorate your home or office with our 2019 American Kidney Fund calendar! For the past 23 years, the American Kidney Fund has conducted a nationwide art contest for young artists who have kidney disease. Thirteen drawings are selected for inclusion in the annual calendar, and the cover art is selected through online voting.